We offer a wide range of services such as driveways, car parks, work yards, pathways, factories, tennis and basketball courts, cross overs, speed humps, crack sealing as well as asphalt repair work including road repairs and traffic management, and re-sheeting. 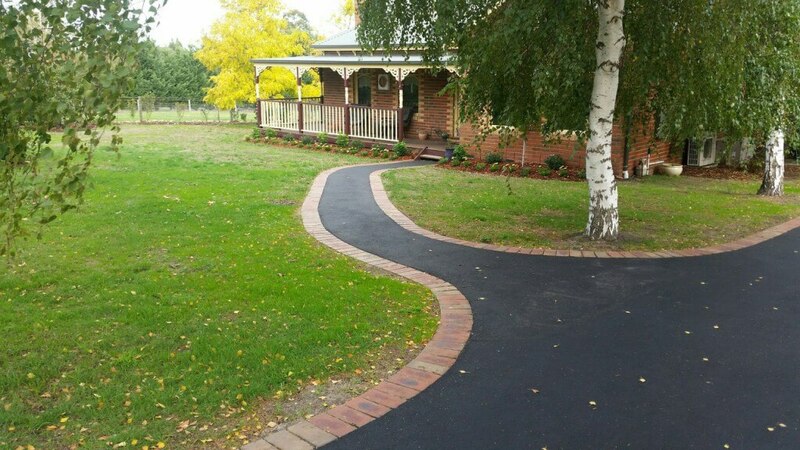 We not only offer asphalting and concrete services but also feature edging, whether brick, timber or concrete, many of our customers choose feature edging as it provides a very smart and sophisticated end result. We will also install drains where required and kerb and channeling. Customers can also choose from a range of asphalt colours such as the most popular black, brown, granite or red. Customers can choose from plain, coloured or patterned concrete as well as exposed aggregate. All our work is guaranteed with terms and conditions and guarantee details included in all our written quotes. We also have $10,000,000 Public Liability Insurance. We believe that what sets us apart from the competition is our quality and pride in our work. All our crew members are well qualified in the asphalt and concrete industries and adhere to strict Workplace Health and Safety regulations. Discount Asphalting offers residential asphalt services to domestic customers at highly competitive and affordable rates. Discount Asphalting is backed by a strong team of highly experienced asphalt crew members and the latest asphalting equipment. We offer a range of domestic asphalt services and asphalt repairs to residential customers. This includes all your asphalting needs from transforming your old, unsightly or worn out driveway into a new smooth uniform asphalt driveway. Discount Asphalting will provide you with no less than highly qualified and experienced workmanship, at very competitive and affordable prices. Discount Asphalting comprises of a highly experienced asphalt crew that have extensive experience in the construction of commercial asphalt and concrete construction projects. Discount Asphalting have the latest equipment to undertake any asphalt project, ensuring a quality finish using only the highest quality asphalt materials, whilst looking at the environmental impact of the projects undertaken and upholding the most stringent quality, Occupational Health and Safety and Environmental Management commitments to it employees and the general public. Discount Asphalting offer a range of options for our customers. If it’s not listed below still contact us to discuss your need and we’ll provide you with our expert options. Discount Asphalting takes care of the whole project from design, construction and project management to ensure you’re completely satisfied with the results. Discount Asphalting can lay asphalt car parks in a range of colours whether it be for a shopping centre, doctor’s surgery, heavy duty work area or an industrial estate. We offer a full range of services including preparation, paving, speed bump and kerb and channel installation. Basketball and Tennis Courts are generally used quite frequently and the surface finish is ultimately key to a good game. We will provide you with a quote for whatever type of requirement you may have when it comes to sports courts. No job is too big or too small. Arrange a free quotation to repair damaged asphalt and/or potholes. Have you got a tired looking driveway or asphalt area? Bring it back to life with our resurfacing services. Our team can seal crack to prevent water penetration and further degradation. We can lay cross over pipes, field inlet pits, grated channels and seepage Ag drains to minimise water damage. Concrete/timber or brick edging can define your driveway and provide longer lasting protection by eliminating erosion and break away. We can add kerbing or channels to the edges of your driveway or car park for added safety, water dispersion and appearance.